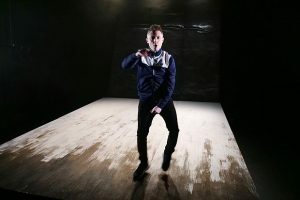 To a soundtrack of techno ebbing and flowing behind him, Davy alternates between dancing wildly, spitting rapid-fire verse at the audience and teetering at the edge of a podium, ready to jump. He’s telling us about his life: the drugs, his pals, peer pressure (‘monkey see, monkey do’ is a refrain), and, to begin with, gives only brief hints about his little girl. The humiliation of having to sign on, and how good he is at Call of Duty. The fact that there are certain things he can’t talk about. He can’t sleep, he has anxiety, but doesn’t understand why he can’t just get a pill to make it go away. It’s particularly common in young dads, he says. His confusion about life is clear: he asked his girlfriend to marry him, but he doesn’t think he really meant it. He wants to sleep, but doesn’t want to be asleep. When talking about the birth of his daughter is when the swagger breaks down and real emotion comes through. East Belfast Boy shows another side of a stereotypical lad, and highlights the importance of mental health help for men. Until Sun 26 Aug, Summerhall, 9pm, £16 (£12).